WordPress is a great solution for just about type of business website, it has lots of useful features built-in and it can be extended with the use of plugins, many of which are completely free to use. 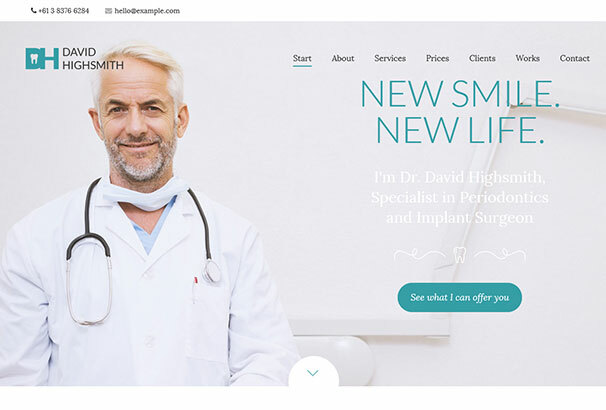 If you are looking to create a new website for your dental practice, it’s worth taking a look at – WordPress is free to download and install on your choice of hosting and the design of your site can provided by a theme which has been specially crafted for this type of business. 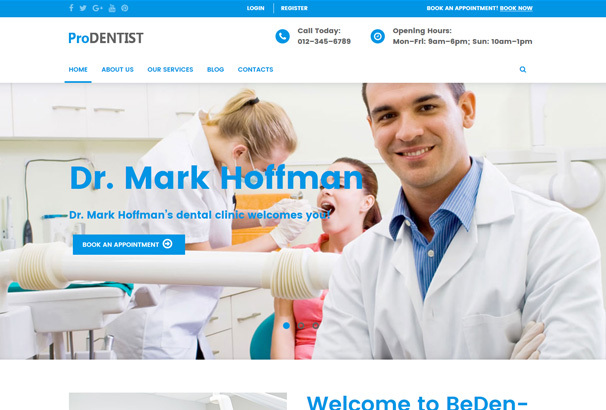 If you are a dentist looking for a brand new and professional web presence to help you gain extra patients for your dental practice, then today’s post is specifically for you. Dentist WordPress Themes are a growing niche which is being catered to by theme developers, we have gathered together over 22 modern, responsive and fresh WordPress themes all designed with dentistry in mind, you can use these themes to build your website with quite easily without having to rely on a web design company to do it for you which could save you thousands. Divi is one of the best WordPress themes available, created by Elegant Themes it allows you to create just about any kind of website without any coding knowledge. 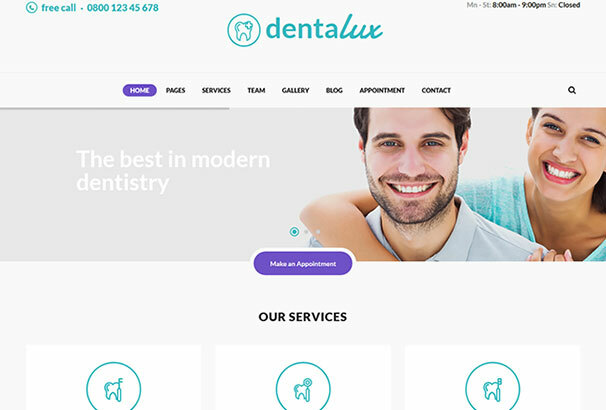 It’s perfect for creating a dentist’s business website as the styling is modern and the theme is responsive and comes with many different modules and page elements which can all be moved using the drag and drop interface. Divi is perfect for people and businesses who don’t have the budget for hiring a freelancer or web design company but want control over their website layout outside the usual theme features. Use our ElegantThemes coupon for 20% off this theme. 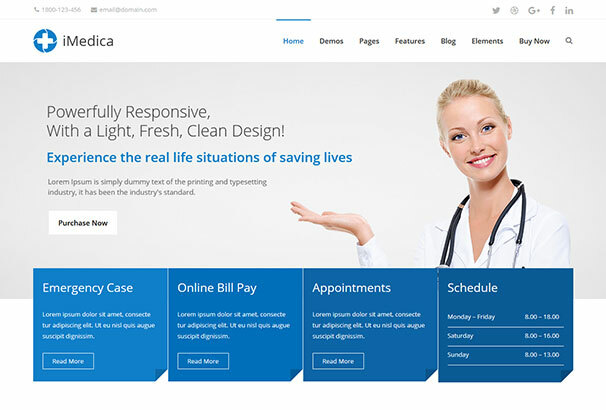 Medica is a simple and professional theme for medical websites and businesses – perfect for a dentists who need a clinical feel. Super simple to setup and looks great on all size screens and devices its also easy to customize for your needs. 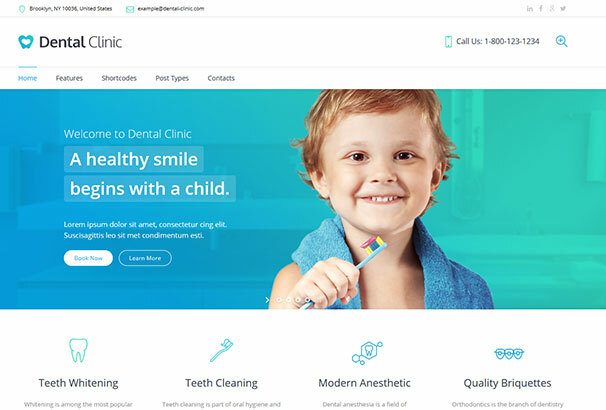 Dental Clinic has a classy and professional feel to it, it uses a simple landing page layout so all the information your patients would need is right there. It is adaptive so works on any device and comes packed with widgets and page templates to help you build your unique website. 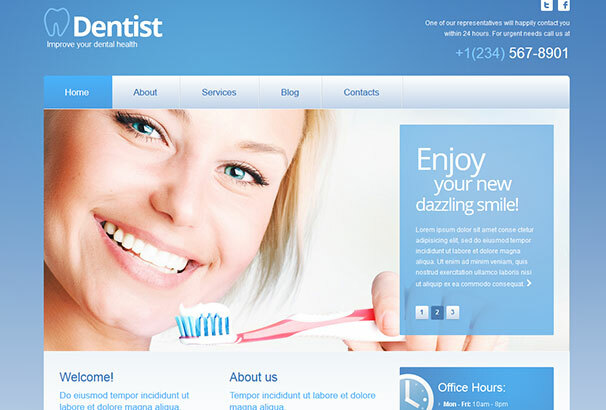 Dentist is a Responsive WordPress theme for a dentists studio by Template Monster. The homepage has a booking button and space for a welcome message, services listing and about us text. 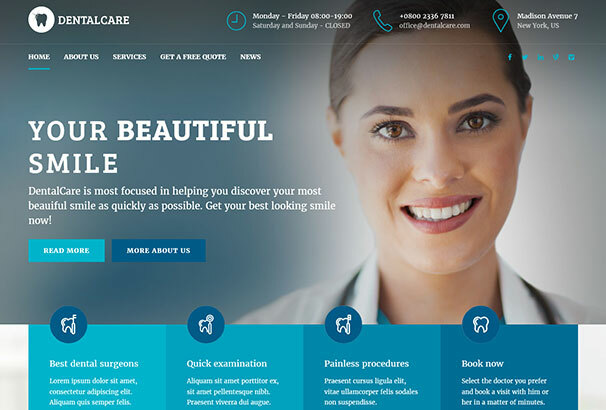 Dentist is a light and well designed theme which uses a boxed layout and appropriate imagery for this kind of website. Upload your own photos to the homepage slider and draw attention to your most important services. If you own a cosmetic dentistry clinic, this theme is for you – the homepage has a large slider at the top and the theme contains sections for staff, galleries of before and after photos, profile, information and contacts. 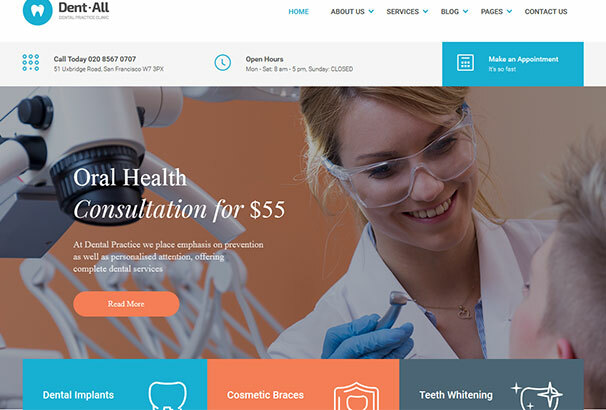 Pro Dentist, is as the name suggests, a WordPress theme for dental professionals which is packed with all the features you need for a complete website – Let your users book an appointment right on your website using an appointment form plugin. You can customize it with a drag and drop page creator. 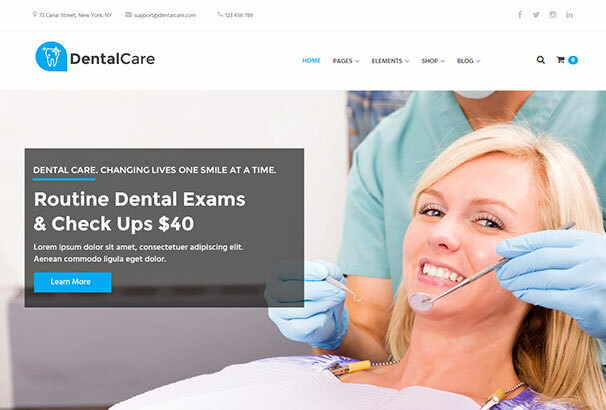 Dental Care is a modern and clean WP theme for dental practices and other medical related websites – it is mobile responsive and comes packed with all the options you need to customize it to fit your clinic’s branding by tweaking colors, uploading a custom logo and so on. 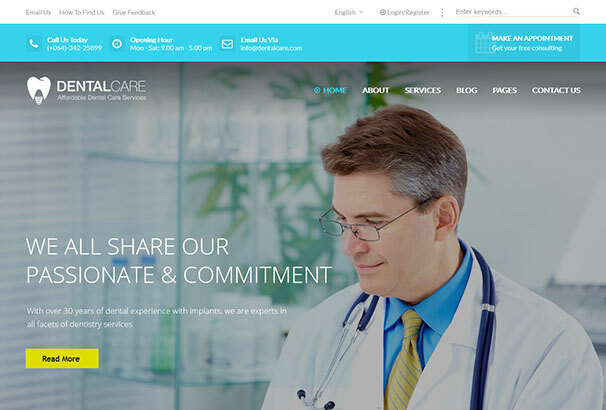 Dentalux is a theme created just for dental clinics and other healthcare sites. It has a modern corporate design which should inspire confidence in your potential patients. Dent-All uses a large header area which you can use to display information about your business or the services you offer. It’s easy to setup and customizable via the options panel so you can tweak it to fit your needs. 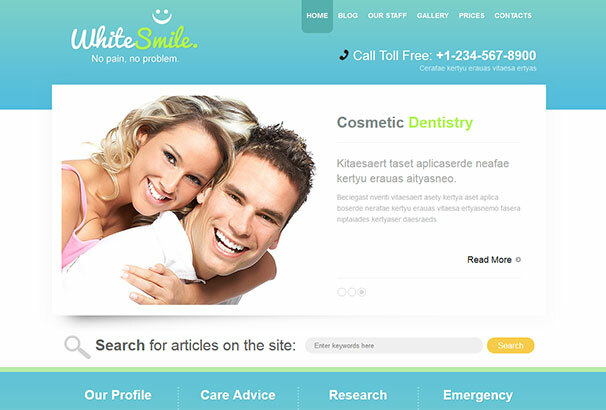 Dentistry is a theme which is highly configurable with 2 different homepages to choose from and different color options. You can also choose different header layouts and choose between a boxed and full-width layout style. Has options for FAQs, job vacancies, gallery for treatment photos so you can show off your best work etc. Dentalcare is a highly professional looking solution for high-end dentists, dental clinics and hospitals. Clearly display your contact information and opening hours on the homepage above a hero image with a call to action button to help drive conversions. Includes a booking system so your patients can manage their appointments online. 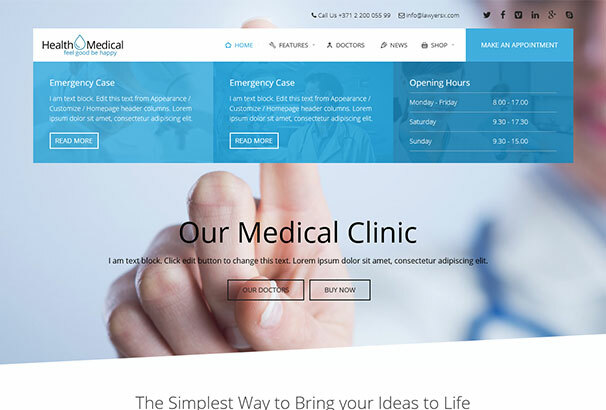 iMedica is a very clean and clinical looking theme for medical websites – it’s responsive and retina ready so will look great on any device from mobiles to iPads and desktops. The homepage has an image area for your most important information and underneath are content blocks for placing information like opening times, appointment bookings and online bill paying facility. 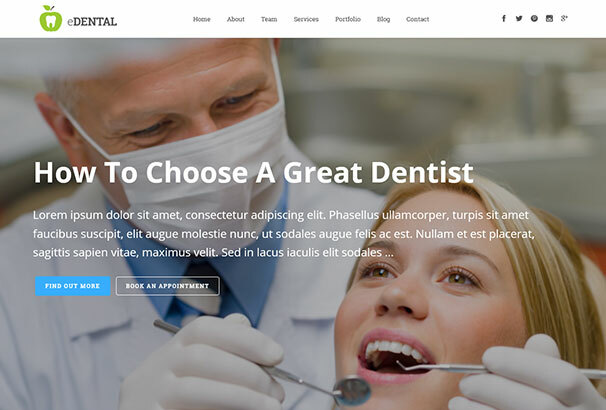 eDental is a theme built with HTML5 and the Bootrstrap framework which could be used by dental offices, dental hygiene, denture clinics, periodontist, orthodontist, oral surgeons and dentist professionals. Simple and easy to setup with no complicated page builders or other required plugins. Medical is a theme for medical businesses with a clean corporate feel to it. The header uses a background image with content blocks displaying information and opening hours over the top. 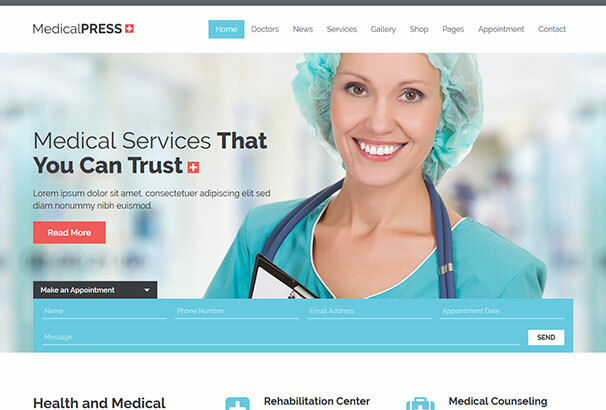 HealthPress is the complete solution for medical and health related businesses – It has attractive design, responsive layout and special features to manage services, doctors, gallery, testimonials, FAQs, blog/news posts and pages. Medicare offers a whole host of customization options via its theme options panel and has unique page transitions, beautiful typography and a customizable quote calculator so you can offer your visitors the ability to calculate the cost of their treatment. 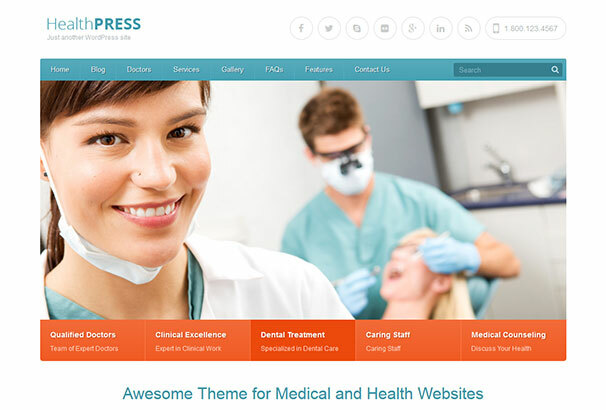 MedicalPress is a large and premium multi-purpose WordPress theme which has been built for all kinds for medical businesses such as doctors, dentists, hostpitals and any other related website. It has a very nice modern design and countless features such as manage appointment forms, facilities, services, doctors, gallery items, testimonials, FAQs, news posts and pages. 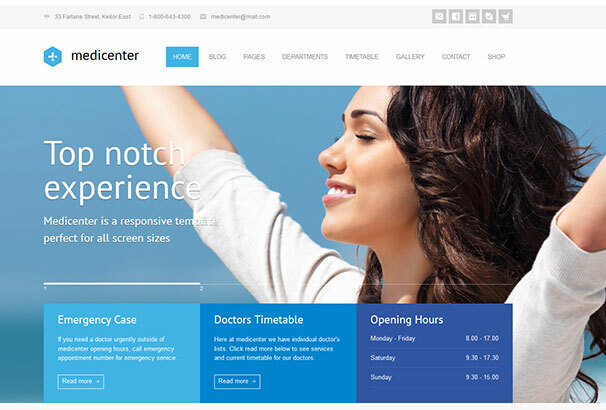 MediCenter is a responsive theme aimed at dentists and other medical professionals. It jam packed with options for creating unique websites such as Timetable PLugins, Custom Headers, Over 20 Page Templates, 6 Different homepage layouts, ajax contact form and it also includes the Visual Composer plugin so you can create new page layouts with a drag and drop interface. 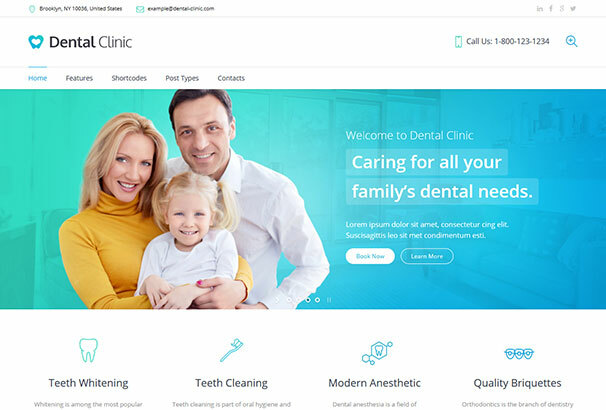 Dental clinic has a modern and clean design with space on the homepage for attractive visuals, services icons, contact details and more information that patients might require. You is a responsive retina ready theme for health professionals and clinics such as cosmetic dentistry. Lots of options for customizing it to suit your needs and adding your own unique branding to it. 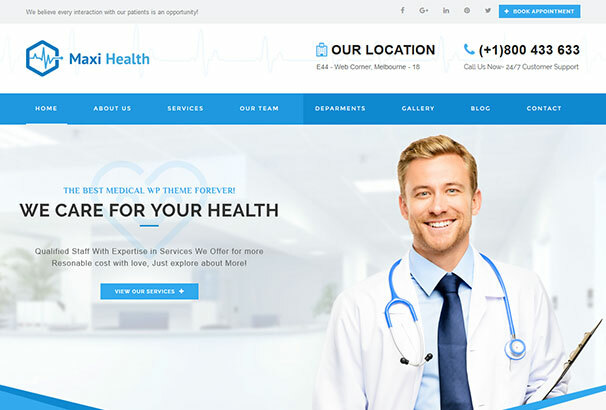 Maxi Health has a great looking homepage layout which oozes professionalism – the header bar incorporates your logo, location and phone number. The large image slider area lets you highlight the main positives about your company. It comes with WordPress Live Customizer, WPML (WordPress Multi-Language) Compatibility, RTL Support, User-Friendly Shortcode Generator and Powerful Admin Panel.